I had so much fun making a December Daily album last year that it is a new tradition that I plan to continue. I'm working with an American Crafts red cloth 8x8 album this year. You can see Ali's flickr group here. 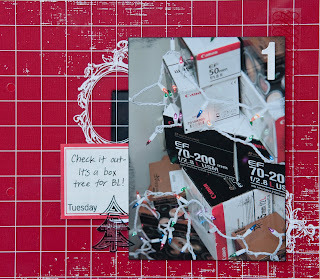 Supplies: Hambly 3/4' Graph overlay- white, Hambly On Edge Border Christmas stickers on, Hambly Elegant label rub ons-white, American Crafts Mini marks Frost phrases rub ons, American Crafts Thickers Vinyl Vera-white, Scenic Route Days of the week clear stamp, and Staz On Ink-jet black. I've decided that in order to keep up with this album (unlike I did last year), I must keep things simple. I'll be sharing each page as I complete it. Thanks for stopping by! I'm so slow! I finally get what the picture is. LOL Good luck keeping up with it. 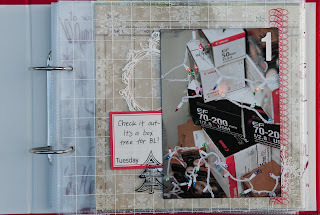 I hope to finish my November Journal/photo a day tomorrow. just dropping by to catch up. i miss our Sunday afternoon chats! maybe we can start back up after the 1st of the year. all your photos are awesome as usually. awesome. you are way better than I am - I always have trouble with daily things!